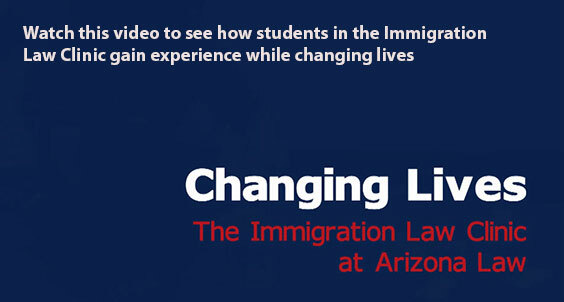 At University of Arizona Law's Immigration Law Clinic, law students provide legal assistance to immigrants under the supervision of clinical faculty. Flickr/Yashmori The Immigration Law Clinic works with many immigrants who are kept at the Eloy Detention Center, about an hour from Tucson. The Immigration Law Clinic provides legal representation mostly to non-detained immigrants in Tucson, Arizona and to some immigrants detained in Eloy, Arizona, in their deportation cases. ​Our clients have included asylum seekers, victims of domestic violence, and long-time permanent residents seeking humanitarian waivers of removal. We have represented immigrants from countries including Afghanistan, Mexico, Ethiopia, Vietnam, and Nepal. There are roughly 3,000 immigrants detained in Arizona on any given day, and most have no lawyer to represent them in immigration court. Representing themselves is particularly hard for detainees, given the complexity of the law as well as their limited ability to access information and communicate with the outside world. Our clinic works in partnership with the Florence Immigrant and Refugee Rights Project, Southern Arizona Legal Aid, the Immigrant Survivors Legal Assistance program, and other organizations serving the immigrant community, to identify immigrants who could particularly benefit from the clinic's representation. Students who take the clinic for six units work in pairs to represent an immigrant detainee in a “removal” (deportation) case. They prepare all aspects of the detainee’s case, from drafting declarations and briefs to preparing witnesses, experts, and direct and cross-examination. The work typically culminates in a hearing before an immigration judge at the end of the semester. We are not accepting any new immigration clients at this time. Working in collaboration with non-profit law offices and pro bono attorneys in Arizona, we aim to help ensure that low income individuals with meritorious defenses to deportation or claims to immigration benefits are able to obtain accurate, nuanced advice about their cases and, whenever possible, direct representation. We also strive to meet the particular goals of each client, and to provide each with the highest quality of legal representation possible. Students can take the clinic for four or six units of credit. The College of Law requires 50 hours of work for each credit of a clinical course. All students participate in an initial two-day training before the semester begins. In addition, all students attend the classroom component of the clinic, which meets for one-and-a-half hours twice a week. The classroom component is partly a skills seminar (covering topics such as interviewing, brief writing, and preparing for trial), but also includes discussions of ethics and professional identity as well as of broader issues regarding immigration law and policy. Issues students confront in their casework are integrated into the classroom discussions so that students may learn from each others' experiences and explore legal and practical issues in context. Students participate in monthly “case rounds” with the Workers’ Rights Clinic, where they have the opportunity to discuss casework and gain exposure to a broader range of approaches to providing legal services to immigrants. Each student is assigned to work on an individual immigration case, usually in pairs. Students conduct all necessary legal and factual research, gather documents, and prepare the written application and other supporting material. For cases that involve a hearing (usually six-unit cases), students also prepare witnesses to testify in court, and represent the client at the hearing. In addition, all students participate in two consultation sessions with indigent immigrants, many of whom are in removal proceedings. The consultations involve interviewing immigrants individually (in pairs, under attorney supervision) and helping them learn and make decisions about their options. All students also prepare for and attend regularly scheduled individual supervision meetings with the clinic's directors. The purpose of these meetings is to develop and review case action plans; ensure thorough preparation and evaluation of all options in casework; and examine ethical, moral, cultural, and legal issues that arise in the course of the work. In addition to attending class and completing the required number of hours per credit, students must complete all responsibilities they have undertaken on behalf of the clinic's clients and must complete and organize all case files. Kate Curl Reitz (Class of 2016) and Adrian Saenz (Class of 2015) won a rare asylum victory for a Central American woman detained in Eloy. They wrote a brief elucidating the complex law involving asylum claims based on domestic violence, conducted extensive interviews of our client and other corroborating witnesses, gathered expert declarations, and handled oral argument and direct examination in court. The client was granted asylum in May 2015 after spending more than one year in detention. Mario Gonzalez (Class of 2017) and Junjuan Song (Class of 2015) won asylum for a young man from Somalia who fled his country after refusing forcible recruitment efforts by Al­ Shabaab. Mario and Juana's tireless work included traveling regularly to Eloy Detention Center, where our client was detained; tracking down family members, a lay witness, and expert witnesses; and assembling country-conditions evidence to corroborate the claim. They represented the client skillfully in a three-hour hearing, after which the government agreed to waive appeal. Our client was released from detention after 11 months and has begun a new life in Phoenix, Arizona. Heidi Nielson (Class of 2015) and Andy Hall (Class of 2015) got their client out of detention on bond in spring 2014. Since then, based on an application establishing that our client was the victim of severe domestic violence, she received work authorization and protection from deportation. In the photo at left Andy and Heidi celebrate her release from detention with our client and her U.S. citizen children. Alexia Brooks (Class of 2012) and Edwin Molina (Class of 2012), prevented the deportation of a young man who has lived in this country since he was nine months old. He has three young U.S. citizen children and a legal permanent resident fiancée. In the photo below, our client holds the judge’s order closing his deportation case, flanked by Alexa and Edwin. Also pictured are former clinic co-director Nina Rabin (front row, second from right) and the clients’ sisters, mother, fiancée, and infant son. Molly Kincaid (Class of 2013) and John Champagne (Class of 2012) represented an Ethiopian asylum seeker who feared persecution if deported. She fled Ethiopia after enduring two lengthy periods of imprisonment and torture by the government due to her involvement in peaceful political protests. She was kept at the Eloy Detention Center for nearly nine months awaiting her asylum hearing. After her release, the clinic worked to ensure that her husband and two children were able to join her in the United States. Rachel Corrigan (Class of 2012) and Lauren Pylipow (Class of 2012) successfully represented a family (below) who needed a special waiver to keep their green cards and stay in this country legally. The mother and her two sons, now 20 and 21, were facing deportation after living here for more than 14 years. The family had been victims of domestic violence and harassment by a U.S. citizen for years. With their legal status resolved, both sons were able to continue their education and other activities: the younger one volunteered helping disabled children and the older one was kept busy by his three-year old U.S. citizen daughter. This client (center) stands with students Laura Belous and Calvin Jones (both class of 2010) outside a Vietnamese restaurant on the night she was granted a humanitarian waiver of removal and released from 13 months of detention. She was soon reunited with her family in California. Kristi Whitaker Trinks (Class of 2012) and Esther Brilliant (Class of 2011) won asylum for an African woman who survived severe persecution, fled halfway around the world, declared asylum at the U.S. border, and was detained in Eloy for more than nine months. The students worked closely with an interpreter to build trust with our client, prepared extensive legal arguments, identified and prepared expert witnesses, and handled all aspects of the hearing. Rigel Massaro and Sohar Quinteros (both Class of 2009) assisted our client in applying for a visa based on extensive domestic violence that she suffered at the hands of her U.S. citizen spouse. Here, the client, flanked by Rigel and Sohar, awaits a bus that reunited her with her family in Nevada after nearly a year of detention. Kristi Whitaker Trinks (Class of 2012) helped in the final stages of her case. Joanna Gauguin and Linda Imonode (both Class of 2010) represented an Afghani client who, along with his family, had suffered horrifying atrocities at the hands of the Taliban. The judge granted him a humanitarian waiver of deportation and, after months in detention, he was able to reunite with his mother, sisters, and cousins in California. Erin Simpson's (Class of 2001) worked on the case for Javier Guevara, gathering documents and co-producing a videotape that convinced the INS district director not to proceed with Mr. Guevara's deportation. Lynn Marcus is director of the Immigration Law Clinic. She launched the clinic as part of the Florence Immigrant and Refugee Rights Project in 1995, and continued as the clinic's director when the University of Arizona became the program's home in 1997. Before then, Marcus worked for nearly every non-profit organization in Southern Arizona that provides legal services to immigrants, initially raising grant money to monitor conditions at immigration detention facilities and to write and distribute self-help pamphlets for pro se immigrants in deportation proceedings. She has represented immigrants in immigration court, before the Board of Immigration Appeals, in federal district court, at the 9th Circuit Court of Appeals, and before the U.S. Supreme Court. She chairs the Advisory Committee of the Immigrant Survivors Legal Assistance program (a part of Catholic Social Service of Tucson), and has co-chaired the Immigration Section of the State Bar. She also teaches a refugee law seminar. Marcus graduated from NYU School of Law in 1989. Gloria Klinicki is the clinic administrator and provides assistance to students, professors, and clients by screening and referring callers, scheduling appointments, reserving rooms, and surmounting logistical challenges. She is a University of Arizona alumna with a bachelor's degree in business administration. She has worked as an accountant, a substitute teacher, and, more recently, an administrative assistant at a local high school.